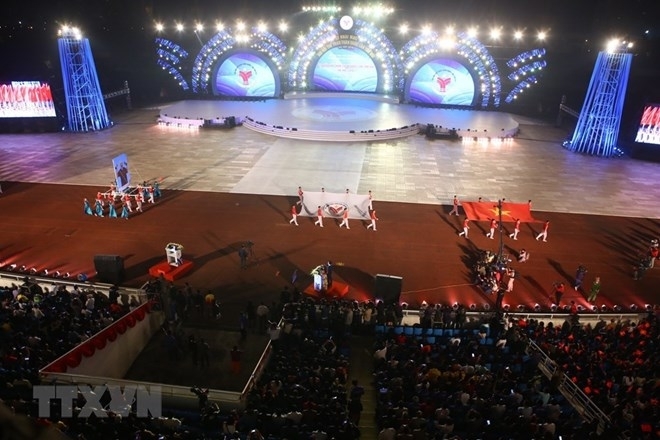 The ceremony was attended by Prime Minister Nguyen Xuan Phuc, Deputy PM Vu Duc Dam, Secretary of Hanoi Party Committee Hoang Trung Hai, representatives from ministries and sectors, and thousands of athletes, coaches, and sport officials nationwide. On behalf of the Party and Government, Deputy PM Vu Duc Dam hailed efforts made by Hanoi city, the Ministry of Culture, Sports and Tourism, relevant sectors and localities in preparing for the sports games. He said that the Games contribute to developing sports while encouraging the habit of physical exercises among local people. More than 7,000 athletes are competing in the games, taking place in Hanoi, the northern province of Hoa Binh and the central province of Khanh Hoa from November 15 to December 10. The athletes, who came from all the 63 provinces and centrally-run cities and the military and police, are vying for medals in 743 events of 36 sports, including golf, karate-do, wushu, pencak silat, athletics, swimming, boxing and fencing. Several events have already begun like body building, springboard, rowing and tennis. Host Hanoi is leading the medal tally with 30 gold, 23 silver and 19 bronze medals, followed by Ho Chi Minh City with 19 gold, 23 silver and 14 bronze medals.